This post was updated on 20/12/2016. Give it a fresh read for latest research and statististics. eCommerce bounce rate may sound like a familiar problem to many. Visitors land on your site, hang around for a few precious seconds and then bounce without visiting another page. The average bounce rate for eCommerce businesses in 2015 was 57%. If the bounce on your eCommerce site is above this number, you should go through these 14 best practices to increase engagement. One reason for high eCommerce bounce rate is that visitors are not able to find what they are looking for. To combat this problem, you have to make your search bar as prominent as possible. According to a Jakob Nielsen report, an ideal search box should be 27-character wide (this research is from 2002). However, search bars on average are only 18-character-wide. Though you can type long queries in short boxes, the problem is that only a portion of the query will be visible at a time. This makes editing or reviewing the query difficult. If you can’t devote so much prime real estate to your search bar, you can try making it dynamic like AllRecipes.com. The search box automatically becomes bigger as one starts typing in the box. 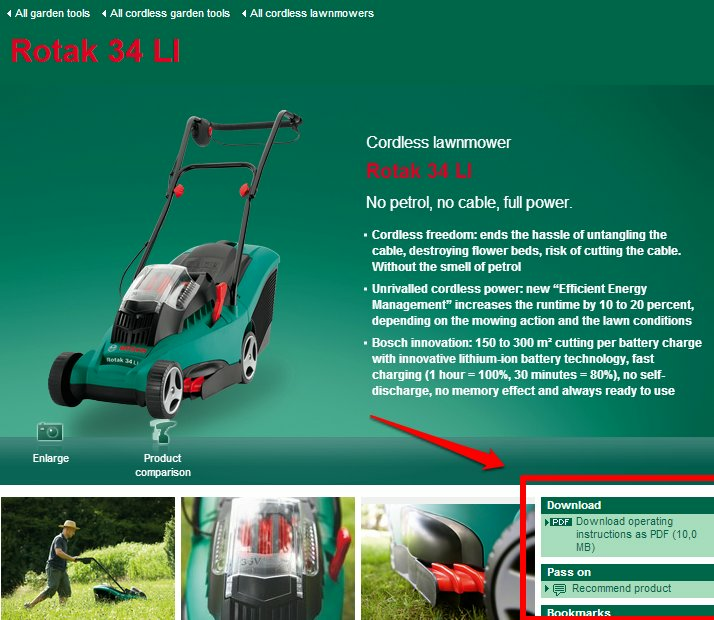 Another way to optimize your search bar is to make it persistent (or ‘sticky’) like Shopstyle UK. Fix it at the top of the page so that visitors who scroll down the page never lose sight of it. Having an ideal-length search box will not be enough if it doesn’t show up the right results. If you’ve never really considered how site-search might be affecting your site experience, then now is the time to do it. A website that loads at a lethargic pace is what one calls a bounce paradise. For every extra second your web pages take to load, your conversions can drop. Decibel Insight’s research on page load time and bounce rate says that slow loaders have a 72% higher bounce rate than fast loaders, and a 38% higher bounce rate than medium loaders. A fast-loading site also scores high on search rankings. 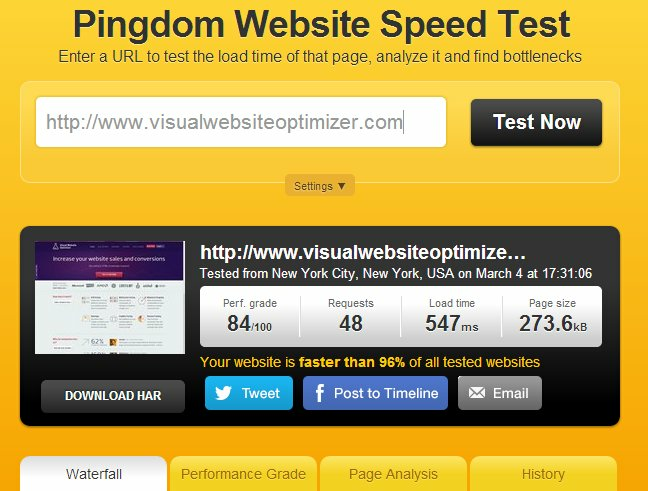 Site speed is critical and you should take all possible steps to make yours faster. Here’s a link to Google’s best practices to reduce loading time. Imagine you have just entered an apparel store. You are walking at your own unhurried pace when suddenly a burly man runs into you with a feedback form. He asks you what did you like in the store, what would make you come back, would you recommend the store to a friend, or would you like to receive their yearly membership card? How would you react? If you possess infinite patience, you might just politely ask him to give you some breathing space — but not before mentally pledging not to enter the store again! Now think of online shopping and modal boxes. Those theatrical pop-ups are a lot like that burly salesman. However, I won’t completely disregard modal boxes. They can be extremely useful in increasing conversions. The key lies in figuring out how long you should wait before making them pop open. If they pop-up too early, you risk strangling the visitor. Time it for a little too late, and the visitor is already off to another tab. Solution? A/B test the popup timing. Play the urgency card to get the visitors hooked. Scarcity has been identified as one of the six persuasion principles by Robert Cialdini in his epic book on influence. One way to engage visitors on the homepage is by displaying your best deals and discounts in the banner itself. 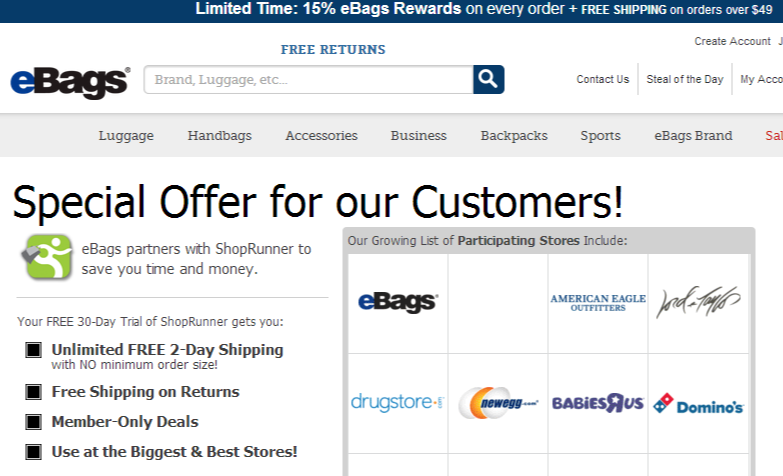 See how eBags prominently displays its limited time offer in the top banner. Limited-time discounts catch eyeballs and you will be doing yourself a great injustice if you don’t utilize them to hook the visitors. Too many choices often confuse people and impair action. Let there be no bombardment of information on your homepage. Simplify your design and work towards reducing distractions. 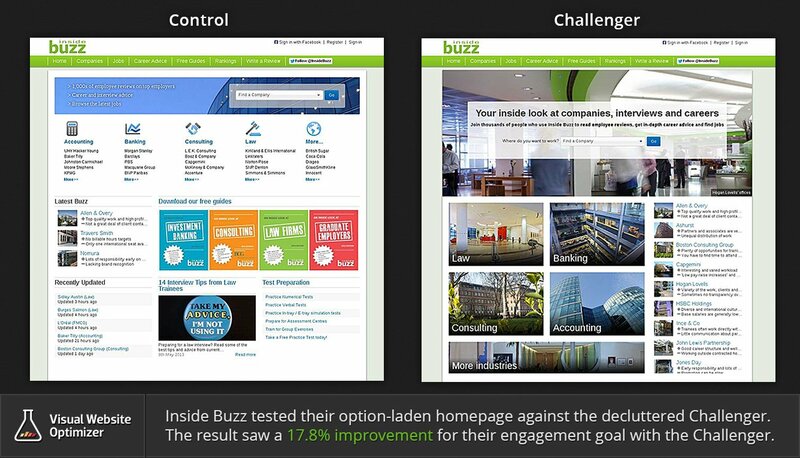 Inside Buzz, a VWO customer, used A/B testing to create a homepage with reduced options. The simplified version increased site engagement by 17.8%. While enhanced product findability and an exhaustive help section will resolve a lot of customer queries, having a 24-hour live chat feature is even a bigger boost. Visitors might get stuck at places you didn’t take into account or they might have questions you never thought existed. If the visitors are landing directly on your product pages, it’s important that they easily identify a call to action (CTA) button to get to the next stage of the funnel. Without a prominent CTA, the visitor will feel stranded and may want to leave. RIPT Apparel, a Visual Website Optimizer customer, saw a 6.3% increase in sales after it made its CTA stand out against the backdrop. It might be the case that the prospect is not yet ready to make a purchase and needs more convincing. In that case, having just a prominent CTA on the product page won’t make the cut. You have to feed him/her with extra information by providing links to product manuals, guides and customer reviews. But make sure there’s a ‘Buy Now’ CTA on all these new links you are making them open. The idea is to keep the visitor on the site long enough to make the sale. So you have got product videos made and uploaded them on all the product pages to grab a pie of the rich online video market? Great. After all, videos have proven to increase conversions for Zappos and many other companies. But beware my friend. In your jest to increase conversions, don’t annoy the prospects by thrusting a video on their face. Don’t auto-play the videos. Please. Just count how many tabs are open in your browser right now. I bet it’s more than 10. (And if it’s any less, I feel you live a truly blessed life). So coming back to auto-play, it can often be annoying when a robotic voice starts reading a script from a tab you can’t identify (actually now you can — Thanks Google). But seriously, auto-play is one of the easiest ways to make someone run away. Good navigation requires intuitively finding out how a visitor will search for a particular product. Create a sitemap and provide its link in bold on the homepage. Design a clear navigation menu and place it where visitors automatically look for them — horizontally on top or vertically on left. One position might work better for you than the other. So you should test the placement. Left menu worked better for one of our eCommerce clients when they ran a split test. You could also think about testing bottom navigation for mobile devices. If you have ads running on your website, try and place them at a position which is least intrusive. 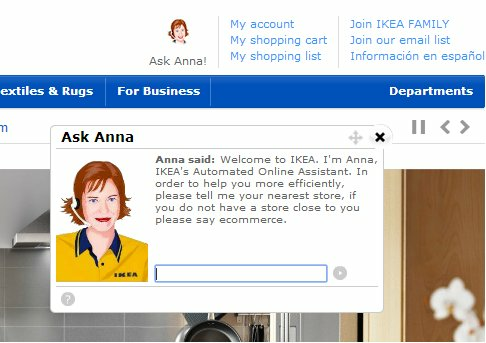 Nothing makes visitors want to run away from your website more when an ad pops over a piece they are trying to read or some product they are checking out. Make sure you are NOT placing the ads where visitors automatically look for information – menu bar, search box or content area. Here’s an excellent post on poorly placed internal ads. ‘Don’t judge a book by its cover’ might be the popular adage. But when it comes to websites, visitors actually do judge them by their design. Design plays a big role in influencing people’s perception of a website’s credibility. A good design automatically makes sure you are taken seriously while a bad design breeds distrust. Try to invest in a neat and uncluttered design. Consistency in terms of fonts, colors and layout is extremely important. Your visitors will be accessing your site either from a laptop, tablet, smartphone or sometimes use all three devices at different stages of the funnel. Responsive web design provides an optimal viewing experience across different browsers and devices. It ensures the layout is resized in a way that the text and images don’t break. Go to Google Analytics and check how much of your traffic comes from tablets and mobile. You should invest in a responsive design even if it’s a nominal percentage compared to your total visitors. Why you ask? Because mobile is the way to go. eCommerce sales from mobiles have been growing at 15% year on year. I would like to create a little list of weapons to combat bounce. Help me with a few suggestions. Tell me what has worked for you in your personal fight against bounce or what you think might work. I will be glad and all that. Note: We originally had the screenshot of LingsCars.com as an example of a bad design under Point Number 13. Though we still feel there’s scope for improvement on that front, we took the image down since they are widely successful and the design is probably working for them. One of the best techniques for reducing bounce rate is to run a message match analysis. This is where you analyse the traffic that is landing on your website to see where it is coming from and the message that was used to send the visitor. You should then ensure that the landing pages use the same messaging so that the visitors know they are in the right place. So if you message on your marketing says 10% off all orders, you should make sure the landing page also has the same message on. That’s a great point David. It’s extremely important to make sure there’s a message match, especially in the case of PPC ads. Thanks for dropping by! we have been experimenting with dynamic offers (sales, whitepaper, event invitation) that are triggered by interest. Integrating Google analytics with our marketing automation tool, we are able to present ads that are based on the search query. For example, if they came to our site from a ‘web performance’ search result, they will be presented with a web performance related white paper. Appealing to someone’s known interest is a great way to further engage. The only catch is that you will need to have a data-driven marketing platform integrated with the website. However Ling’s cars, which is one of the examples you use actually defies the rules. In fact she has a very successful business on the back of that ugly looking website. Yes, a clean design works … however that was not such a good example! I don’t run an ecommerce site but much of this would still work for us. I use dynamic offers for my website, so if the visitor has taken certain actions within my site, or downloaded an ebook, etc. they will be prompted with an offer that’s tailored to their experience. Some excellent ways to reduce the dreaded bounce rate. Another way that retailers can look to reduce this is by factoring in some form of personalization or localization into what you show up. For example, Amazon will tailor what are the hot ticket items on their pages by the trends that are prevalent in the country of the user. If sites are able to harness this they can make sure that they can display as relevant content as they can based on the scant level of detail they might have on the customer. Can I know what is for you a good way to collect visitors Emails on online shop ?